Actvity Summary: Using Google Earth and ocean cores to analyze seafloor spreading. Evaluate sonar and core data collected by the Ocean Drilling Program (ODP) that support seafloor spreading. 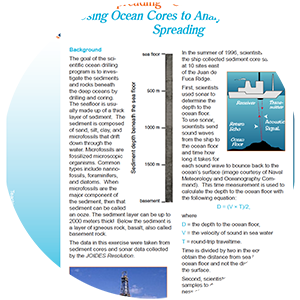 Use the data to create a graph showing the relationship between distance from the spreading center, depth to the ocean floor, and thickness of the sediments.